1Histopathology Department, Directorate General of Khoula Hospital, P. O Box: 90, Postal code: 116, Muscat, Sultanate of Oman. 2Department of Plastic Surgery, Directorate of Khoula Hospital, Sultanate of Oman. 3Department of Radiology, Directorate of Khoula Hospital, Sultanate of Oman. Address correspondence and reprints request to: Hunaina Al-Kindi, Histopathology Department, Directorate General of Khoula Hospital, P. O Box: 90, Postal code: 116, Muscat, Sultanate of Oman. Al-Kindi H, George M, Malhotra G, Al Muzahmi K.An Uncommon Presentation of Giant Cell Tumor. Oman Med J 2011 Sept; 26(5):359-361. Giant Cell Tumors commonly occur at the ends of long bones. However in rare cases, they can occur in the bones of the hands and feet. Tumors in these locations occur in younger patients; in addition, these tumors are more commonly multifocal and are associated with a higher risk for local recurrence than tumors at the ends of long bones. Since lesions in the small bones may be multifocal, a patient with a giant cell tumor of the small bones should undergo a skeletal survey to exclude similar lesions elsewhere. Primary surgical treatment ranges from curettage or excision with or without bone grafting to amputation. The success of surgical treatment depends on the completeness with which the tumor was removed. We are presenting a case report of a 34 year old female, who presented with a swelling in the right hand, following trauma. 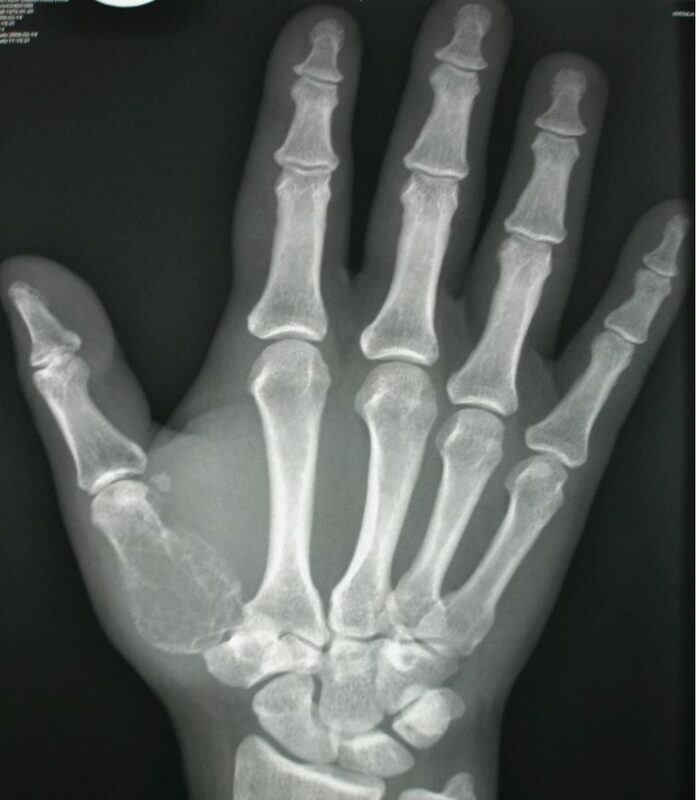 X-ray of the hand showed an osteolytic expansile lesion at the base of the 1st metacarpal bone. The lesion was initially curetted and then treated by local resection with bone grafting. 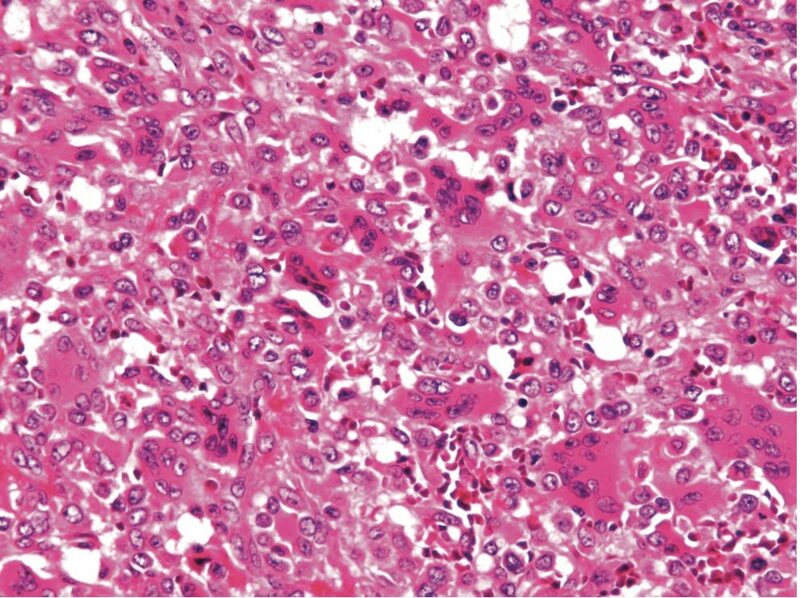 Histological examination revealed a typical benign giant cell tumor composed of closely packed stromal cells with a variable admixture of giant cells. Follow up at the end of one year did not reveal any recurrence of the tumor. Keywords: Giant cell tumor; 1st metacarpal bone. Giant Cell Tumor of the bone is a benign tumor. It is locally aggressive with a tendency to produce local recurrence and occasional metastasis. Giant cell tumor is commonly seen in the epi-metaphyseal ends of long bones of young adults and more prevalent in women than in men. Rarely, it can occur in the bones of the hands and feet.1-13 The metacarpal bone is the most common site on the hand and may be multifocal.12,13 The clinical features are non specific; however, majority of cases present as expansile lesions associated with pain.1-12 Patients who present with acute pain may have associated fracture, which brings the tumor to clinical attention.10 The morphological findings of giant cell tumor in the hand are similar to that in other locations, and consist of large numbers of osteoclast-like giant cells in a background of epithelioid to spindle shaped mononuclear cells. We present a case of giant cell tumor of the 1st metacarpal bone, which was treated initially by curettage and then later by local resection and bone grafting. 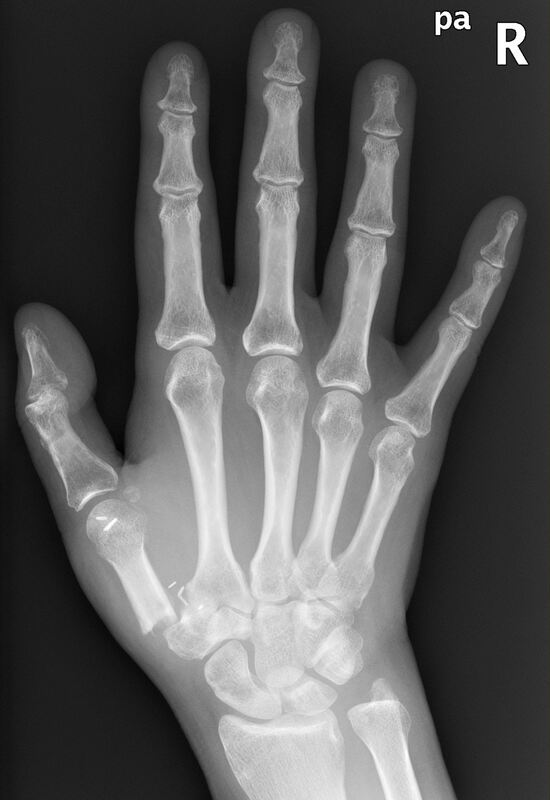 Figure 1: X-ray of the hand showed an osteolytic expansile lesion at the base of 1st metacarpal bone. 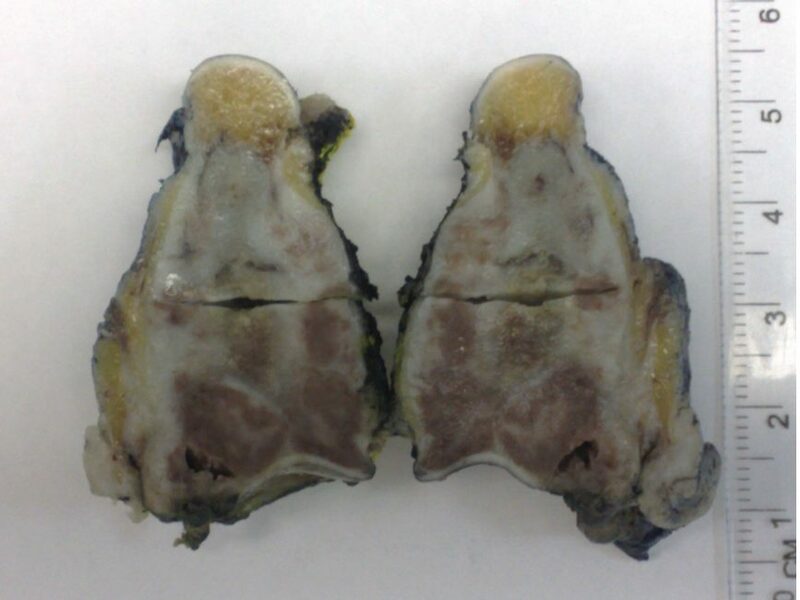 Grossly, we received multiple fragments of yellow soft tissue, which together measured 3 × 2.5 × 1 cm. A month later, we received an amputated metacarpal bone measuring 4 cm in length and 2.8 cm in maximum diameter. The dorsal part showed irregular ellipse of skin with underlying subcutaneous tissue measuring 1.7 × 0.5 × 1 cm. Cut section showed an irregular grey to brown mass at the central part of the bone measuring approximately 3 cm in maximum dimension, (Fig. 4). The cortex of the bone was intact. 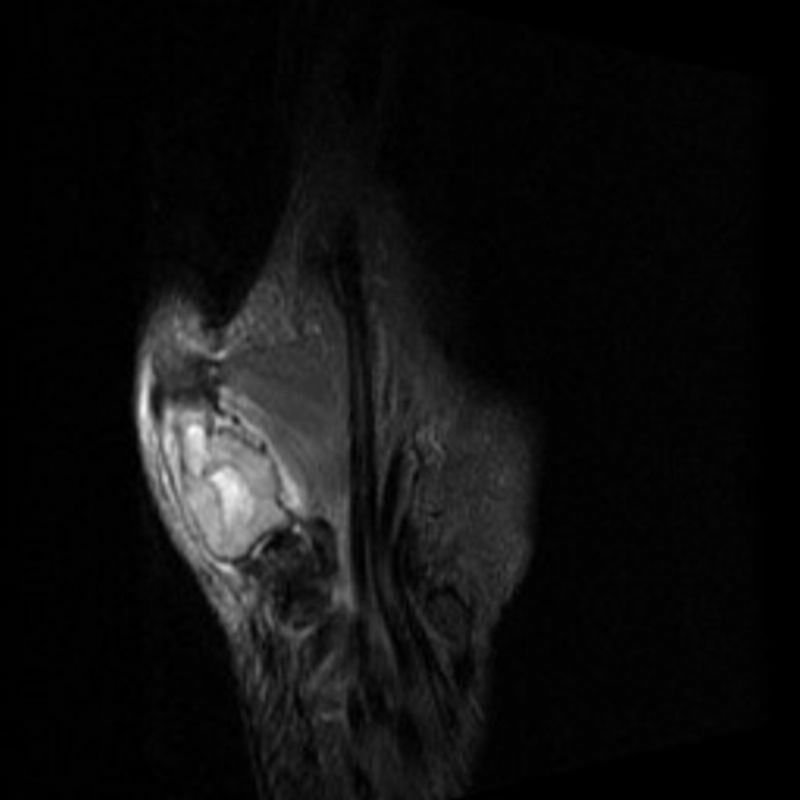 Figure 2: (a&b) MRI coronal T2- FATSAT and Post contrast T1-FATSAT revealed enhancing expansile solid lesion of the 1st metacarpal with central necrosis. Figure 3: X-ray of the hand after local resection with bone grafting. 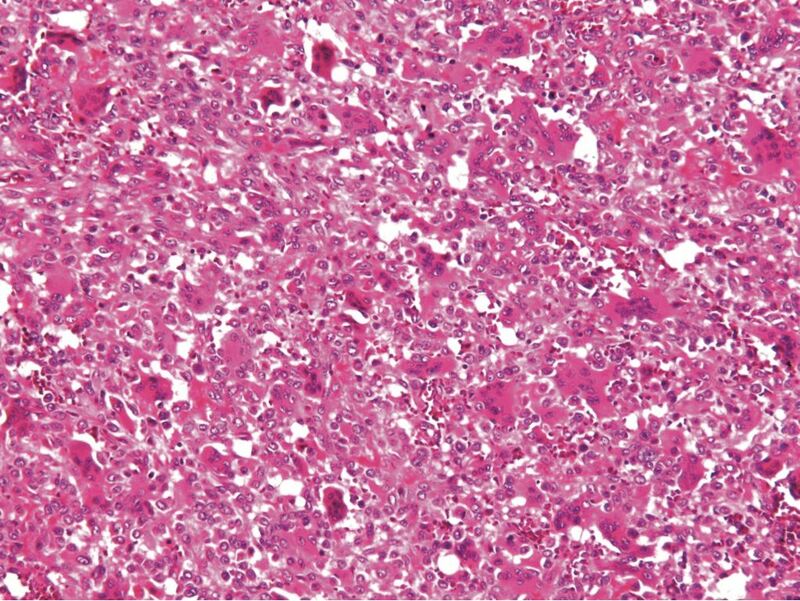 Histological examination of the curetted tissue and from the resected tumor, revealed a typical benign giant cell tumor, composed of closely packed stromal cells with a variable admixture of giant cells. Mitoses were noted but there were no abnormal forms, (Figs. 5a&b). Scattered lymphocytes and hemorrhage were noted in the stroma. Figure 4: A cut section of 1st metacarpal bone showing irregular grey to brown mass at the central part of the bone. Figure 5a: Mononucleated stromal cells with multinucleated giant cells can be seen (H&E, original magnification ×200). Figure 5b: Mononucleated stromal cells with multinucleated giant cells can be seen (H&E, original magnification ×400). Giant cell tumor is a benign bone tumor, which commonly occurs at the distal aspect of the femur, proximal part of the tibia and the distal end of the radius.4,5 Involvement of the bones of the hands are uncommon (about 0.9 to 3.3%).2,12 They are commonly found in the younger age group and more prevalent in females than in males.2,4 The metacarpal bone is the most common site seen on the hand.1-12 Pain and swelling are the most common presenting symptoms.3 A few cases present with history of trauma, followed by swelling as in our case.2,10 Association with trauma, induces pain that plays a role in bringing the tumor to clinical attention. These tumors are not known to be associated with environmental factors and they are not inherited. This is a case report of a giant cell tumor with typical clinical, radiologic and pathological findings. It is important to identify these lesions because it is associated with more aggressive behavior and high chance of recurrence and multicentricity. 1. Uppin SG, Sundaram C, Umamahesh M, Chandrashekar P, Rani YJ, Prasad VB. Lesions of the bones of the hands and feet: a study of 50 cases. Arch Pathol Lab Med 2008May;132(5):800-812. 2. Biscaglia R, Bacchini P, Bertoni F. Giant cell tumor of the bones of the hand and foot. Cancer 2000 May;88(9):2022-2032. 3. Wold LE, Swee RG. Giant cell tumor of the small bones of the hands and feet. Semin Diagn Pathol 1984 Aug;1(3):173-184. 4. Dhillon MS, Prasad P. Multicentric giant cell tumour of bone. Acta Orthop Belg 2007 Jun;73(3):289-299. 5. Wittig JC, Simpson BM, Bickels J, Kellar-Graney KL, Malawe MM. Giant Cell Tumour of the Hand: Superior Results With Curettage Cryosurgey, and Cementation. J Hand Surg [Br] 2001;26A:546-555. 6. Dahlin DC. Caldwell Lecture. Giant cell tumor of bone: highlights of 407 cases. AJR Am J Roentgenol 1985 May;144(5):955-960. 7. McEnery KW, Raymond AK; MecEner KW. Giant cell tumor of the fourth metacarpal. AJR Am J Roentgenol 1999 Apr;172(4):1092. 8. Kapoor A, Golwalaa PP, Patela KJ, Desaib DV, Yeluric SV. Giant cell Tumor of first Metacarpal. The Internet. J Orthop Surg 2004;2(1). 9. Shaw JA, Mosher JF. A giant-cell tumor in the hand presenting as an expansile diaphyseal lesion. Case report. J Bone Joint Surg Am 1983 Jun;65(5):692-695. 10. Kulenovic E. Giant Cell Tumor. Appl Radiol 2008;37(12):37-39. 11. Kim JA, Park JS, Park SY, Jin W, Park YK, Han CS, et al. 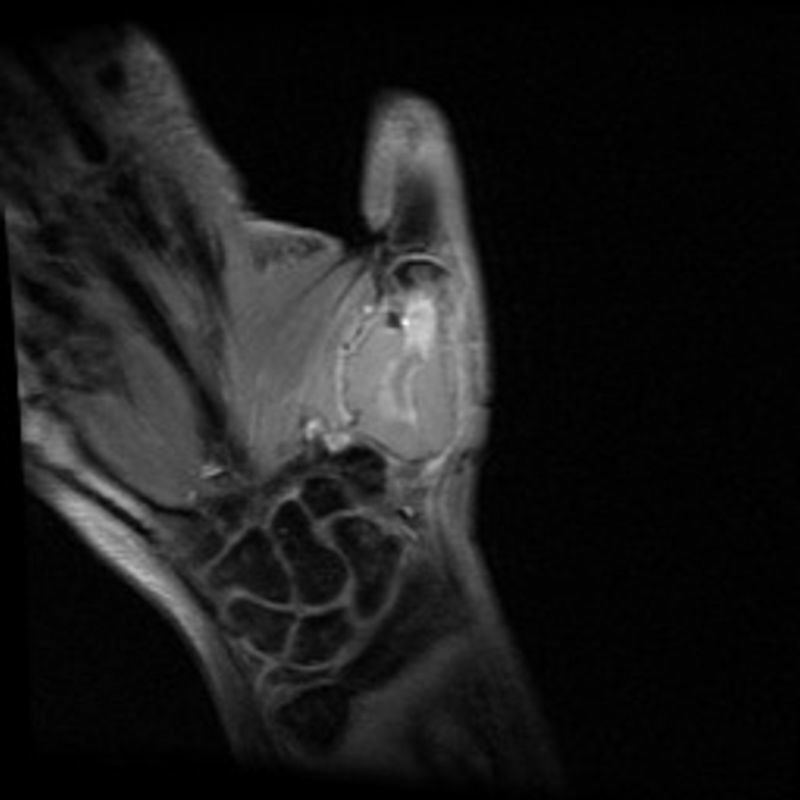 Aggressive Behavior of a Giant Cell Tumor Involving the Metacarpal Bone During Pregnancy: Case Report. J Korean Soc Radiol 2011 May;64(5):509-513. 12. Minhas MS, Mehboob G, Ansari I. Giant cell tumours in hand bones. J Coll Physicians Surg Pak 2010 Jul;20(7):460-463. 13. Unni KK, Inwards CY. Dahlin’s bone tumours. 6th edition. 2010:310-6, 333-40, 352-3, 364-8. 14. Davila JA, Amrami KK, Sundaram M, Adkins MC, Unni KK. Chondroblastoma of the hands and feet. Skeletal Radiol 2004 Oct;33(10):582-587. 15. Smith SE, Bruno MA, Coombs BD, Sundram M, Krasny RM, Chew FS. Imaging in fibrous cortical defect and non ossifying fibroma. http://emedicine.medscape.com/article/389590-overview. 16. Neville BW, Damm DD, Allen CM, Bouquot JE. Oral and maxillofacial pathology. 3rd edition. 2009:626-629.